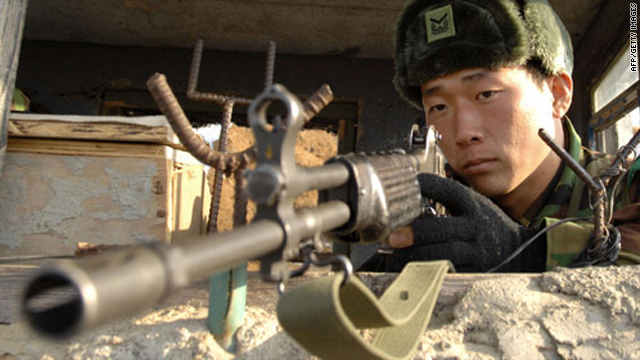 Seoul, South Korea (CNN) -- North Korean and South Korean military units exchanged gunfire near their border Friday, South Korean authorities said. The exchange happened after North Korean forces fired two rounds from a 14.5 millimeter machine gun at a South Korean military guard post near the border town of Chorwon, South Korea, about 73 miles (118 km) northeast of Seoul, according to an official at the Joint Chiefs of Staff. The South Korean unit responded with three "warning shots" from a .50-caliber machine gun and warned the North Korean guard post by loudspeaker to desist, the official said. The demilitarized zone at the location of the shooting is 1.3 kilometers (0.8 miles) wide. Chorwon was the scene of heavy fighting during the 1950-53 Korean War. Video: Scariest place on earth? North Korea on Friday threatened to retaliate against its neighbor for shunning bilateral military talks. The gunfire exchange apparently won't cancel reunions of families separated by the Korean War, which ended in a truce but no formal peace treaty. The weeklong reunions begin Saturday at Mount Kumgang, the two countries' joint mountain resort in the North. North Korea has requested record shipments of rice and fertilizer in exchange for concessions on the reunions, the South Korean Yonhap news agency reported earlier this week. While there are occasional shooting incidents across the demilitarized zones, the tensest flash point on the peninsula in recent years has been the disputed maritime border in the Yellow Sea. There were fatal naval clashes there in 1999 and 2002. In March this year, the sinking of a South Korean vessel killed 26 in what a South Korean and international investigation team concluded was a North Korean torpedo attack. North Korea continues to deny involvement. The prickly relationship between the countries since the Korean War has had periodic conciliatory moves and flare-ups. Friday's incident occurred two weeks before the G-20 summit in Seoul. The G-20 includes industrialized nations and developing economies, which focus on economic issues and economic policy coordination. Authorities said a total of 50,000 police and riot police will be deployed during the summit on November 11 and 12, according to Yonhap. Journalist Andrew Salmon contributed to this report.